Once you’ve used a pepper mill with a light built into it – like these gorgeous choices I found below – you’ll never go back to the manual grinders you used in the past. They’re more formal, do all the work for you, and help you make sure to season just the food you want with just the right amount. For dinner parties or everyday use, these are so cool that you’re liable to take it with you even when you go out to eat. Yes, these are larger than the small salt and pepper shakers you might usually keep on the table, but they’ll hold more and let you use different grades of spices. The see through chamber is made of glass. The outside is brushed stainless steel. You can adjust the mill to grind more course pepper or make it more fine. It automatically lights up during grinding. It’s a nice 7.5 inches in height. This pair of salt and pepper mills sits on a charging station when not in use. Off of the base, they’ll run continuously for 20 minutes – which is more than enough time to get you through several meals. They’re done in a beautiful brushed stainless and illuminate the food with LED lights when you use them. 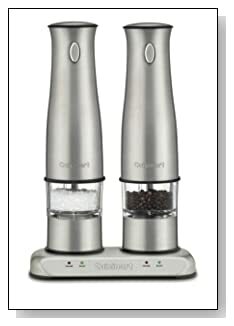 They have adjustable grinder settings so you can make either the salt or pepper more or less course. The Elis USelect is the cream of the crop. It has a unique method for grinding the peppercorns that is better than other models. There are six different course settings. It automatically lights up while you’re using it and you can tell the difference in flavor between the different sized grounds.